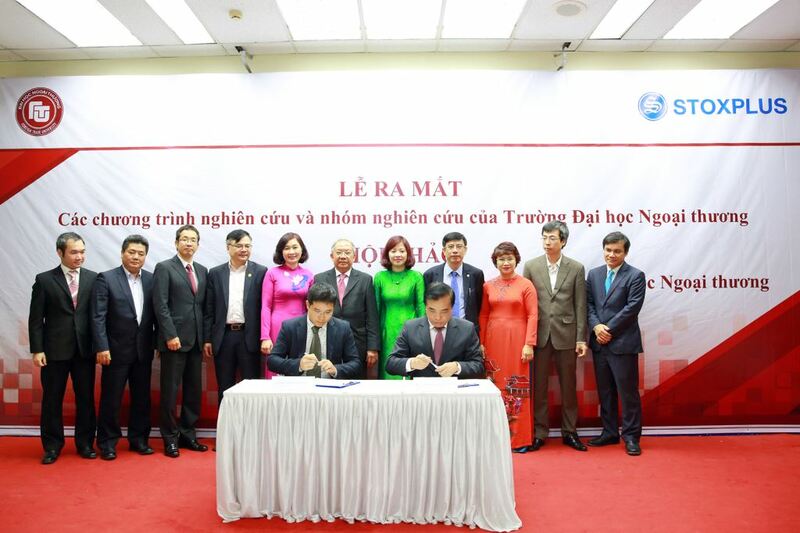 Hanoi, 11th January 2017, StoxPlus signed an agreement to provide FiinPro® Platform for Foreign Trade University to help boost research activities in the university. Attending the signing ceremony were Ph.D Le Trong Hung, the head of Science, Technology and Environment Department of the Ministry of Education and Training, Mr. Nguyen Tien Dung, chairman of the State Securities Commission’s office; Professor, Ph.D Tran Van Nhung, General Secretary of the State Professors Council; representatives from the National Financial Supervisory Commission of Vietnam, the State Bank of Vietnam and researchers from the Foreign Trade University, other universities and research institutions. In the framework of co-operation, StoxPlus provides data by (06) FiinPro® Platform subscription for the University. The direct users of FiinPro are 24 groups of researchers and those working under 4 research programs in 2017-2019 period, teachers at the university so as they can access the most updated information for their lectures. The signing ceremony again highlighted StoxPlus’ efforts to boost transparency in the market and help educate the future financial generation. Ms. Truong Minh Trang, FiinForm’s managing director from StoxPlus said: By subscribing FiinPro®, researchers and teachers at FTU can use the terminal to gain access to the financial database of Vietnam including market/trading data (basic and level 2), corporate database of not only listed companies but more than 2000 public companies with aggregated revenue of approximately 70% of Vietnam’s GDP, industry data including monetary markets and macro data. Users can also use many basic and advanced functions and tools which are highly customized for Vietnam markets jointly developed by StoxPlus and QUICK Corp. (part of Nikkei Inc.). Mr. Nguyen Tien Dung, representative from the SSC said : the SSC has supported the cooperation and research from raising the questions to evaluate the research results and using the research findings to support policy making. The cooperation model of FTU and StoxPlus is a completed one which helps to provide most updated market data into research and put research results into policy making. On the same day, StoxPlus and FTU also held a conference on “using StoxPlus’ data in experimental research” to introduce research works as results of cooperation between StoxPlus and FTU.